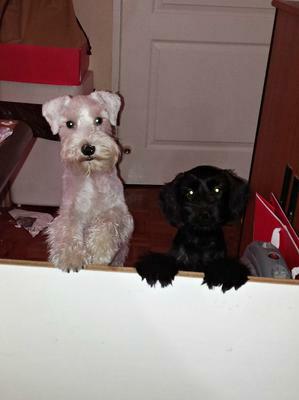 Max & Millie or white and black Schnauzers spend much of their day in our home office apart from when they are chasing each other around the garden or playing "Bitey Face" all over the house. Last week following end of year accounts, Catherine was trying to sort out her drawers and files. Problem was every time she opened a drawer there were two Schnauzer muzzles in there trying to helpfully remove whatever they could get in their mouths. Catherine finally gave up and put up a barrier to stop them getting in. The photo is of Max one year old and Millie five months old doing their best to get over the barrier. At the mpment it is quiet as they are at the groomers being clipped although this means they will arrive home full of themselves and full of energy! NOTE FROM LINDA: Yes, our Max tries to help in the office - but most of the time he just snoozes in a corner! I'm waiting for the next photo. What fun you must have! !